I came up with a new drink over the weekend using a very exciting recent addition to my home bar—peach bitters. (And considering that yesterday was the start of SF Cocktail Week, I feel as though I should talk about alcoholic beverages as much as possible.) So anyway I made this tasty drink, but then couldn’t think of a name for it, which is typical. Imaginary band names are a dime a dozen in my head, but drink names always stump me. So I decided to employ the use of my favorite research helper, Google, and typed in “drink name generator” in hopes that such a thing really did exist. Of course, you know it did because clearly a lot of people have way too much time on their hands. I will share with you some of the results that I found particularly amusing. Needless to say, I do not really foresee this ingenious device to be a part of my future drink-naming endeavors; however it did suit its purpose for this particular drink. Behold! I give you the Random Apple Oblivion, courtesy of Seventh Sanctum. Pour all ingredients in a cocktail shaker filled with ice, stir well (for about 30 seconds at least) and strain into a chilled martini glass. Garnish with a sliver of oblivion. 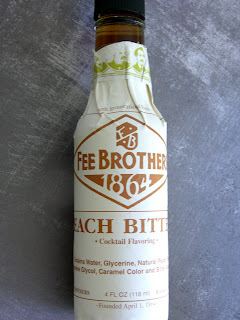 A note about these Bitters: Fee Brothers makes a quite a few flavors of bitters these days, including cherry and mint, which I have not yet had the opportunity to sample. I do highly recommend their orange bitters and whiskey barrel aged bitters. You can find a selection of them at Cask in San Francisco (and of course online in my Amazon store), and a few more recipes to accompany the bitters can be found at the Fee Brothers website.